Wow, Snallygaster (maybe the best beer festival in DC? Discuss…) is now in its seventh iteration. So many good beer drinking memories. Let’s make more. 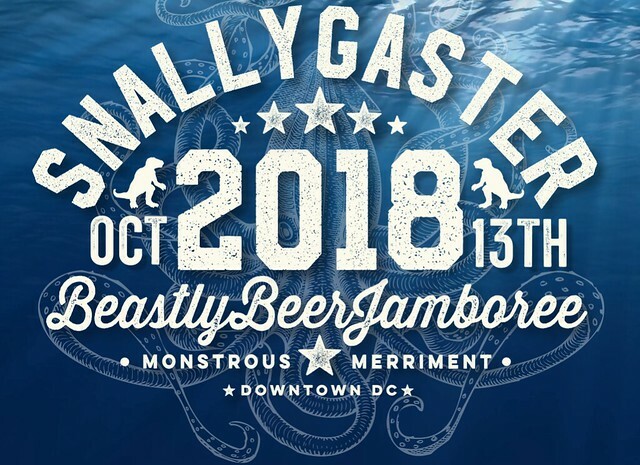 New for this year’s Snallygaster is a shift from from the traditional September date to October and a move from The Yards (next to Nationals Park) over to Downtown, along Pennsylvania Ave. Presumably they can spread out and be bigger and beastier over the four blocks of awesome beer tasting options. Have you been to Snallygaster before? They call it a beer geek out for good reason. Put on by the Neighborhood Restaurant Group (NRG), whose beer bonafides include Bluejacket and Churchkey, Snallygaster typically offers tastings of 350 beers or more. Curated to include anything you might love, and everything you think you should try. I always enjoy the beer experience as the harbinger of my pumpkin beer phase of the year, known as Fall. But seriously, even if you don’t do pumpkin, that’s just a small fraction of the offerings. Have a look at the 2017 list here. Update: Here is the 2018 Beer List of Breweries. They are releasing the beer list in small bursts via Twitter. We’ll do some previews of the beers we’re looking forward to once the 2018 list drops into our eager laps. To expand your mind, read what we thought of the Snallygaster 2017 edition. Spoiler Alert: Good things. more equitable and sustainable local food system in the DC area. So drink beer to help people. One difference in the format compared to a traditional beer festival, it’s not all you can drink. You get a certain number of beer tickets (30) with your entry pass, and each beer costs between 4-9 tickets, and when you use them up, you can buy more! So employ a modicum of strategy with your quaffing. The tickets can also be used for food. General Admission is $40. 1:30pm Entry + 30 beer/food tickets. VIP is $65. 12pm Entry + 30 beer/food tickets. P.S. Hey! You! Get your tickets right now, because you will hate yourself if it sells out! Go here.